On September 27, 2018, Princess Sofia of Sweden attended board meeting of Sophiahemmet. Sophiahemmet is a private hospital at Norra Djurgården in Stockholm. It is associated with the Sophiahemmet University College. On 1 January 2016, Princess Sofia was announced as the honorary president of the hospital, replacing Princess Christina, Mrs. Magnuson, who had served as honorary president since 1972. 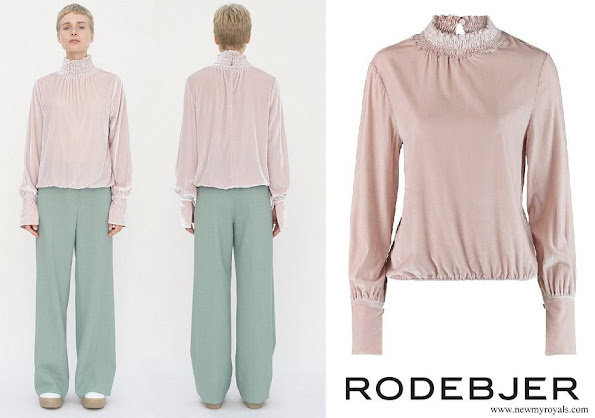 Do not care for the high neck design of this blouse. Wonder what the rest of it looks like. Beautiful picture of Pss Sofia. Lovely blouse and good to see her hair in ponytail for a change. mooie blouse en kapsel bijéén is ook mooi, niet steeds naast de oren. I had the same looking blouse in early seventees, nice. Did you keep it? You see it is trendy again! Some fashion needs to stay in the past for sure. Coralie, unfortunately I didn't keep it. I would like to wear it now :) I even have the same size as then. Lucky you! I wish I had! -P Sofia looks good, lovely colour on her! Nice top do not like the neck part. I think she looks lovely. Love the hairstyle and the blouse too.